WINNIPEG – Talk about making a statement for May 2012 when you have five sales over a million dollar each propel the monthly MLS® dollar volume level to over $400 million for the first time in WinnipegREALTORS® 109 year history. Beyond the 5 mega sales, May saw over 1,600 sales in total – making it the second best May and month ever next to May 2007 with MLS® sales of 1,652. Dollar volume in May 2007 was less than $300 million. A fabulous month indeed and it demonstrates buyers are as active as ever in taking advantage of exceptionally low mortgage rates and one of the most affordable major real estate markets in the country. Some months you are fortunate to get one million dollar plus sale so to have five in one month is atypical and indicative of strength in the luxury end ofWinnipeg’s real estate market. The most expensive of the group went for $1,200,000. It is a newer fully loaded 3200 sq. ft. home in Assiniboine Landing – an upscale development inSouth Headingley. There have now been two consecutive months where residential-detached sales in the over $500,000 price range have significantly outnumbered the under $99,999 price range. This was not the case in 2011. MayMLS® unit sales increased 10% (1,605/1,463) while dollar volume went up 17% ($411.4 million/$350.0 million) in comparison to the same month last year. Year-to-date sales are ahead by 5% (5,434/ 5,144) while dollar volume has risen 12% ($1.33 billion/$1.18 billion) in the first five months. 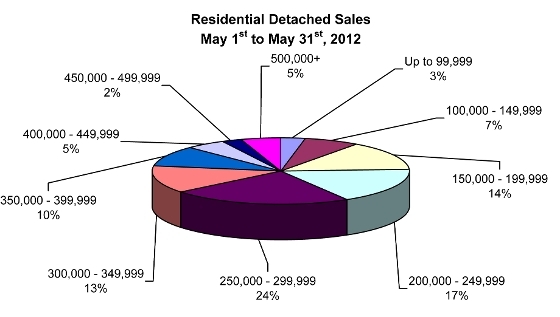 To indicate just how active and robust May 2012 performed, nearly one out of every two MLS® listings available sold. A 50% turnover in inventory left active listings at the end of May down from the same time last year by 3%. Not surprisingly given the strength of theMLS® market in May, there were more homes that sold for above list price than below list price. Despite the success of this month, it is really important to stress that all property types and specific property types within a local real estate market do not perform or act the same. Two good examples substantiate this point. Condominium sales were more in line with last May sales, while resort properties were actually down from the same month last year. In sharp contrast duplex and single-attached were dramatically higher in sales activity and residential-detached and vacant land showed decent increases. When examining residential-detached sales, a number of the desirable City of Winnipeg MLS® neighbourhoods are seeing far higher sales conversions of listings and fewer days on market than many rural municipalities. For residential-detached sales in May, the most active price range was from $250,000 to $299,999 with 24% of total sales activity. Dropping back in market share but still second is the $200,000 to $249,999 price range at 17%. Two-thirds of all sales are from $150,000 to $300,000. 30% of condominium sales fell in the $150,000 to $199,999 price range but the next laddered range of $200,000 to $249,999 is growing in market share with 21% of total sales. Average days on market for residential-detached sales was 24 days, two days quicker than last month and two days off the pace set in May 2011. Days on market for condominium sales was 28 days, 9 days faster than last month and the same rate as May 2011.